This song was written for my dear friend Jenny when she turned 40. 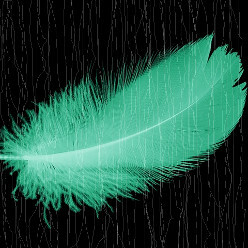 The main idea being that a feather is something that has virtually no weight, which creates a paradox with the "weight of time" as in the sum of all past events (maybe emphasised by the fact that time itself doesn't have any actual weight either...). Also the idea of wearing it in the hair is a symbol that came from native Americans to represent their past victories - in the present case it's much more peaceful but still represents some real personal fights. finally 40 candles on a birthday cake, that's plenty of little lights with loved ones who celebrate with you to light up and warm up your heart. All in all, it was a rather spontaneous creation and straight acoustic recording with my portable digital recorder to simply capture the moment. Many special thanks to Adeline for creating the picture.